This blog is part of a new “Spotlight on NTIA” series. We’ll be highlighting the work that NTIA employees are doing to advance NTIA’s mission of promoting broadband adoption, finding spectrum to meet the growing demand for wireless technologies, and ensuring the Internet remains an engine for innovation and economic growth. Many people spend their working lives in one career. Emy Tseng, a program officer with NTIA’s Broadband Technology Opportunities Program (BTOP), is working on three. Tseng has worked at NTIA since it launched BTOP in 2009. But working to expand broadband adoption and digital literacy wasn’t her first calling. After graduating from Brown University with a math and physics degree, Tseng went to work as a software engineer. After years of working with technology, she decided she was more interested in working on ways to provide access to new technologies. In 1999, she left her job to obtain a degree in technology and policy at the Massachusetts Institute of Technology. The degree eventually led her to San Francisco, where she landed a job with ZeroDivide.org, an organization aimed at promoting digital inclusion. She went on to lead the City of San Francisco’s efforts to close its digital divide. After NTIA launched BTOP in 2009, Tseng headed back to the East Coast to work as a program officer on its sustainable broadband adoption and public computer center grants. The 2009 American Recovery and Reinvestment Act provided funding for the BTOP program, which focused on broadband sustainability, public computer centers and broadband infrastructure. Tseng is part of the team overseeing broadband adoption and public computing center grants. She works primarily on grants involving public computing centers and broadband adoption projects in major cities and also with school districts around the country on projects that help students get computers, training and home broadband access. Tseng is passionate about the importance of helping to close the digital divide. As more services and opportunities move online, she notes that Americans who could most benefit from these services are being left behind because they lack the skills or the access to broadband technology. While she enjoys being in a job where she can help people, Tseng also has another passion: Brazilian Jazz. 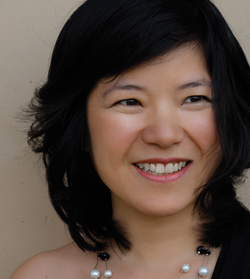 In her free time, Tseng moonlights as a jazz singer and released her first CD in February. She says she fell in love with Brazilian Jazz music in recent years and now performs much of her music in Portuguese, Brazil’s official language. Despite her love of jazz, Tseng says she has no plans of giving up her day job. “My regular job gives me perspective,” she says.